I just walked over to the Hosseini Building to look at your work. It's awesome! I especially love the little girl sitting backwards in her seat - not looking directly into the camera, but rather taking in the vastness of the place and the moment. The crowd's shhuffling soft attentive movement creates visceral depth, and the offset individual photos makes it ease off the wall and encase the viewer. It's in an excellent position in the room, not only fitting the wall space perfectly, but THE perfect piece for the wall, by way of reflecting one of the HosseiniBuilding's famous photography shows of the National Geographic photogrpher, showing one of the most famous photos in the world! 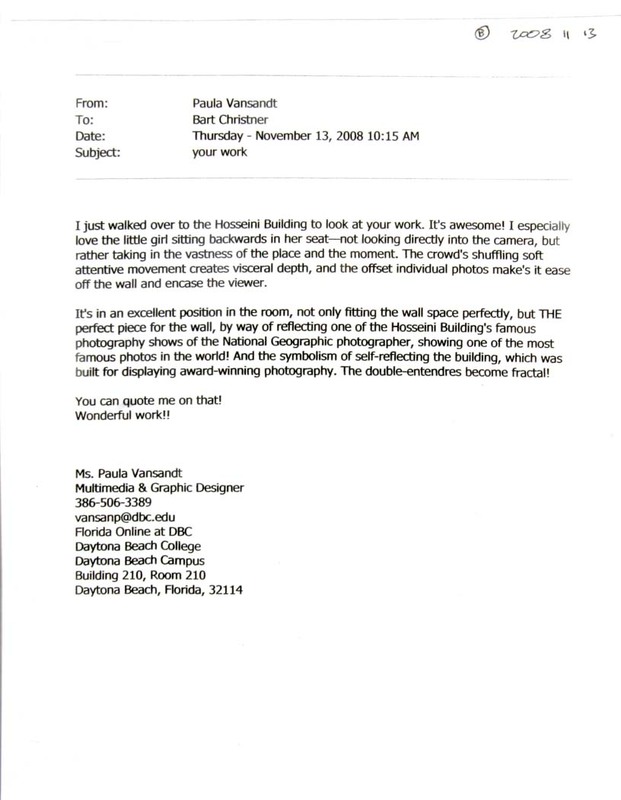 And the symbolism of self-reflecting the building, which was built for displaying award-winning photogrphy. The double-entendres becomes fractal!